New Orleans has a musical village where every house is an instrument! #MusicMonday « Adafruit Industries – Makers, hackers, artists, designers and engineers! 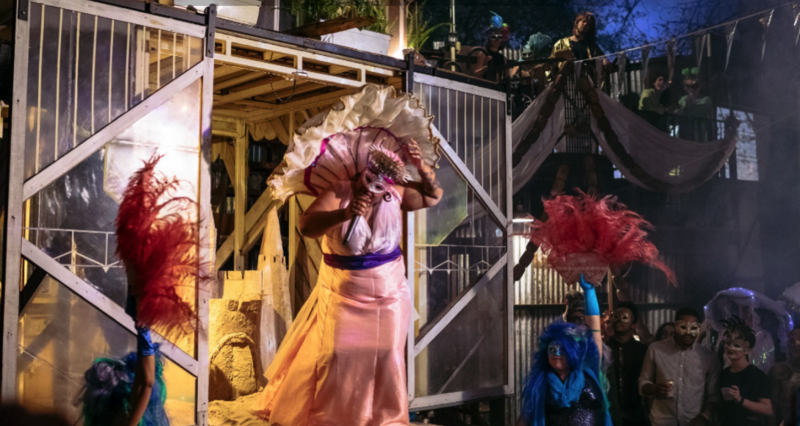 The Music Box Village is a venue/art-space/project/instrument in New Orleans. Located in the former yard of a large-scale steel fabricator in the Bywater neighborhood of New Orleans, Music Box Village is an art-installation-slash-music-venue featuring a collection of shanties and ramshackle treehouses that explode with music when they are opened, or tugged on, or smacked with a stick. There’s a collection of painted buckets and oil drums under a canopy, like a psychedelic version of a Trinidadian steel pan set. There’s a shed with enormous wind chimes, each tuned and labeled with the name of a musical note that plays when the wind or an enthusiastic attendee with a mallet comes by. There’s a telephone booth, whose microphone and rotating speakers throw a performer’s voice across the venue. There’s a stilted structure that looks like it might begin hovering at any moment, with fans that evoke helicopter rotors. When you pull on the ropes that dangle beneath the fans, they begin spinning quickly enough to emit celestial whistles and hums, as the plastic piping that entangles their blades catches the air like a whirly tube.